Congregations and faith communities throughout our service area come together to combine their volunteer, fundraising, and prayer efforts to help realize our shared vision of a world where everyone has a decent place to live. Communities of faith are an important part of the success of Habitat Newburgh. Our very first house was a Unity House sponsored by the collective efforts of local faith communities. To date Faith Build groups have sponsored 27 of the 80 homes that we have completed and 10 of the 30 A Brush with Kindness repair projects. 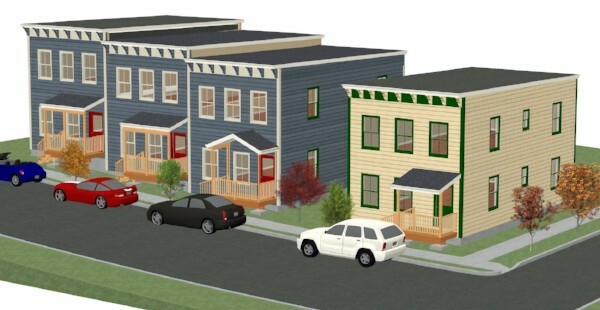 When Habitat Newburgh built its 22 home E. Parmenter Street Neighborhood Development, a flagship of our community-building work, one set of five connected houses were designated as the Faith Builds, with each home sponsored by a Faith Build partner. Currently under construction we have Faith Builds II, another set of Habitat homes that will be supported by countless prayers, volunteer hours, fundraising events, and donations big and small from communities of faith. Four future homeowners will look forward to living in a decent and affordable home, surrounded by wall built with great love. You and your faith group can be a part of this meaningful ministry of shelter. Contact our Fund Development Manager to find out how your faith community can get involved.